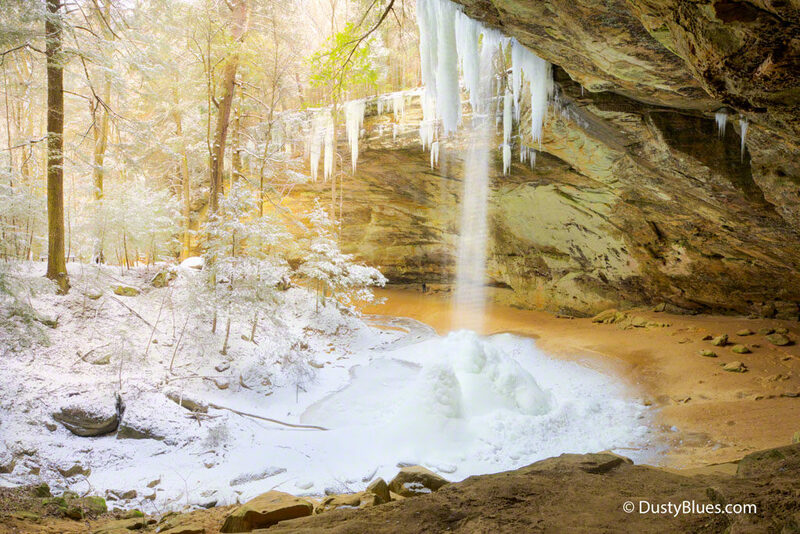 Ash Cave is one of the most readily accessible Hocking Hills park areas. A flat½ mile asphalt path leads back to a view of the Falls and overhang. Towering hemlocks, a cascading waterfall, soaring cliffs and a wide recess cave make Ash Cave an amazing place to visit. It is located in a gorge of “Black Hand” Sandstone. Due to thousands of years of erosion, principally caused by the last glaciation around 17,000 years ago and carved by a tributary of Queer Creek, which flows through the gorge, the cave has been evolving ever since. This cave got its name from the huge piles of ashes that early settlers found when first visiting. No one is certain how the ashes got here but it in most often believed that the native American Indians tribes, including the Shawnees who roamed the area, used this place for shelter and the ashes are from their camp fires. Archaeologist’s have confirmed this during the early years of the park when the ashes and remains were cataloged prior to being hauled away. Early European settlers used the cave as a church, until they could construct an actual building to house their congregation. The Hocking Hills State Park is located in Hocking County in southern Ohio and is part of the Wayne National Forest. The land which comprises Hocking Hills Park is part of the Allegheny Plateau, a large plateau spanning from central New York to the north, through Pennsylvania and eastern Ohio, to West Virginia to the south. Over 330 million years ago, the Hocking Hills region was covered by the Atlantic Ocean, depositing the sand and gravel which eventually formed the “Black Hand” sandstone the area is known for, named after a black hand print petroglyph left by American Indians on a cliff face near what is now Newark, Ohio. After a time, the ocean receded, and millions of years of erosion from streams and groundwater cut through the soft middle layer of sandstone, resulting in the iconic rock formations and natural features the region is known for today. The residual moist climate allows many tree and plant species which require damp environments to grow in this region, such as hemlocks and Canadian yews, which are otherwise not found in Ohio. The Back Hand sandstone of this region is most often very porous rock and much more susceptible to erosion than many other types of stone. There are three (3) differing layers with various thicknesses that comprise the Black Hand sandstone, the top and bottom layer are more resistant to erosion and are packed more densely then the loose conglomeration of the middle later. This middle layer is much more susceptible to long-term erosion and the freeze thaw of the weather. Due to this many of the wonderful formations such as Ash Cave were formed. Ash Cave is the largest recess cave in Ohio. This erosion has created a recess in the sandstone that is approximately seven hundred feet long, one hundred feet deep, and ninety feet high. A waterfall cascades the 90 feet into the gorge at the center of Ash Cave. In 1924, the State of Ohio purchased 146 acres of land in the Hocking Hills. This purchase formally established Hocking Hills State Park. The State eventually purchased additional land, including Ash Cave. Initially operated by the Ohio Department of Forestry, in 1949, the Ohio Department of Natural Resources and the Ohio Division of Parks assumed control of Hocking Hills State Park. Today, Ash Cave and Falls comprise one of a number of non-contiguous State Park regions and is a popular attraction to visitors from many surrounding states. Trails lead into the gorge and also a rim trail that circumnavigates the gorge. Another trail, part of the larger Buckeye Trail system, leads up to Cedar falls and on towards the Old Man’s Cave area. An annual Winter Hike in conjunction with the Frozen Festival in nearby Logan, Ohio attracts numerous hikers to hike this eleven (11) mile round trip. In the late 60’s and early 70’s Grandma Gatewood visited here to winter hike which evolved into today’s annual winter event. Grandma, famous for through hiking the Appalachian Trail in to 1950’s several times, resided just south of the Hocking Hills and has a trail here named in her honor. 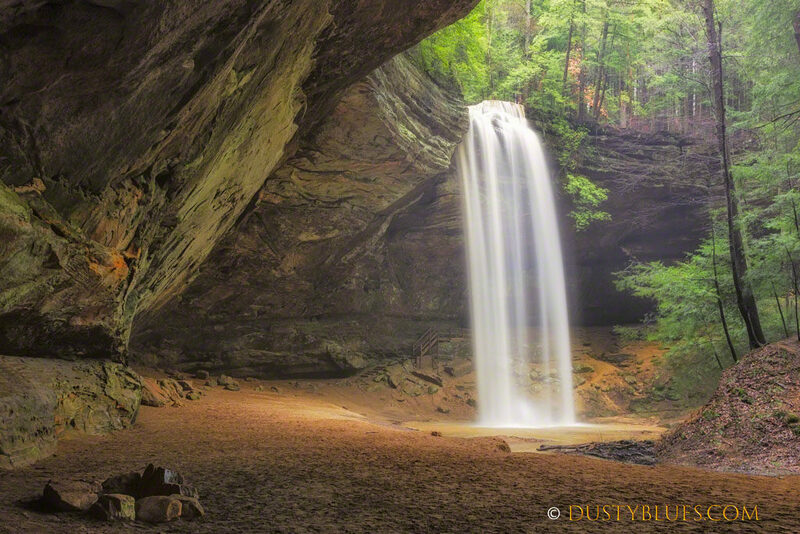 This entry was posted in Fine Art, Hocking Hills, Reflections and tagged Hocking Hills Fine Art Photography on February 9, 2019 by Dusty Blues.